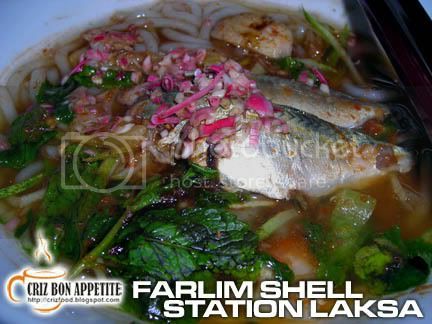 It has been as a long time since I have taken any Laksa and decided to visit the famous Farlim Shell Station Laksa stall. Coincidentally, PenangTuaPui also have the same thoughts as we went exactly to the same shop, the same day, only at a different time. The last time I went to the shop for their Laksa, they where at the opposite coffee shop where the crowd was amazing. When I went back to the same shop the other day, I was stunned by the lack of customers and stalls in that shop. 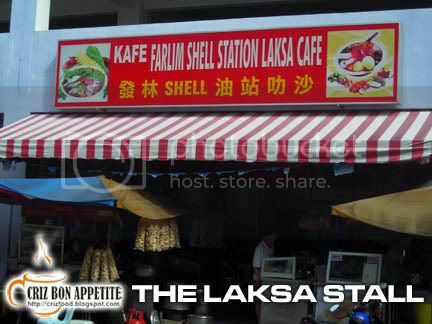 Then only did I realize that they had moved to the opposite coffee shop with a big signboard “Farlim Shell Station Laksa Café”. Walking by the Laksa stall, I could smell the fragrant assam aroma of the boiling Laksa soup. Upon finding a cool spot to sit down, I ordered a bowl of their famous Laksa (RM3). It came with a full boneless Ikan Kembong (Indian Mackerel). It was so fresh that you could even see the glitters on its body. The yummy local delicacy consists of thick and spingy rice vermicelli, lots of sliced big onions, cucumber, lettuce, pineapple, chilies and some mint leaves and shredded bunga kantan (torch ginger); accompanied by the fragrant soup base (a combination of assam peel, blended shallots, garlic, chilies, candlenuts, galangal, turmeric, shrimp paste (belacan) and lemongrass); and topped with thick hae gou (black prawn paste). Although the total dish was great in taste, I still prefer it to be spicier and sour to my liking. Maybe it could be due to the change of cook as I felt that when they were selling along the roadside at the Shell Petrol Station (Jalan Angsana), the soup tasted better. Anyway, the stall did sell some crispy spring rolls (90sen each) too. It tasted real nice when dipped into the Laksa soup. As the bowl of Laksa could not fill up my ever hungry tummy, I ordered a set of Steamed Bun with Bak Kua (BBQ Pork Slice) and Bak Hoo (Pork Floss) costing me RM2 for both. As for drinks, I ordered their Ching Po Leung (RM2) which has lots of ingredients such as green sago balls, Attap Chee (Nipah Palm), red beans, red sweet potatoes, dried and wet longan (dragon’s eyes) and some jellies. Although the dessert tasted quite fine, I prefer it to have more sweetness from the Lo Han Guo (magic fruit) instead of adding more syrup. 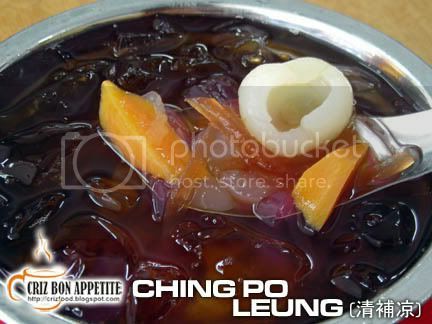 By the time I finished that bowl of Ching Po Leung, I was still thirsty from the humid weather. 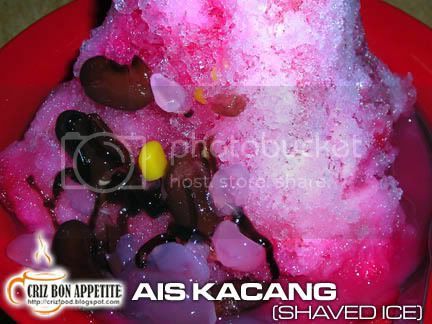 I tried out their Ais Kacang (Shaved Ice) at RM2. The sweetness and creaminess seemed to be missing from this dessert. Moreover, there were not much ingredients in it except lots of shaved ice. 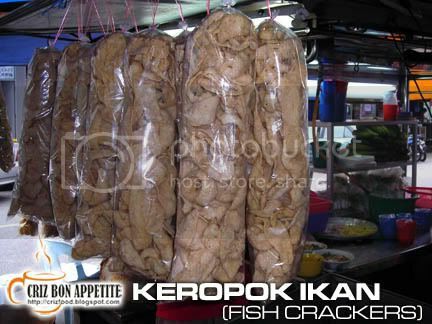 Feeling still half filled, I saw some long packets of Keropok Ikan (Fish Crackers – RM3) hanging by the Laksa stall. I bought one packet home to test it out. It was great. The crackers were really crispy and puffy without any hardness in them. This is a must to have while watching TV as I had finished one whole packet within minutes. If you are not a local, you might get lost trying to find this place. 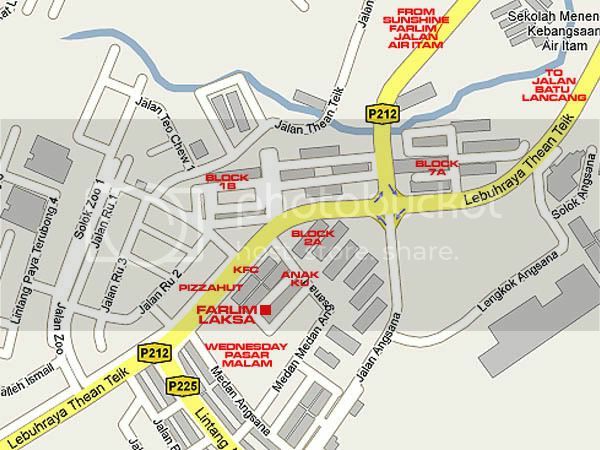 It is in fact within the latest commercial area in Farlim, Air Itam, next to where they have the biggest Pasar Malam (night market) on every Wednesday night. If you are coming from the main road at Jalan Air Itam into Farlim (Jalan Thean Teik), you would pass by one traffic light until you reach a crossroad traffic light. Block 7A is on your left. Turn right into Lebuhraya Thean Teik. Drive forward until you see a small lane on your left (Medan Angsana 1). Drive into the lane until you see Anak Ku Baby Wear Shop. Turn right into the road (Medan Angsana 4) and you will see the shop on your left towards the end. Medan Angsana 4, Bandar Baru Air Itam, 11500 Penang, Malaysia. Wah! 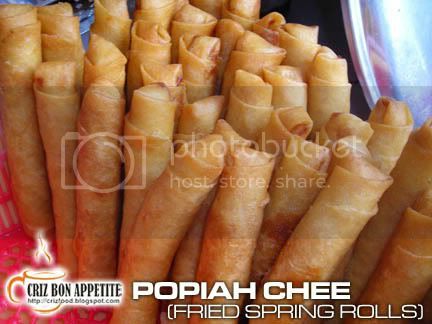 The popiah and the roti bak kua make me drool! 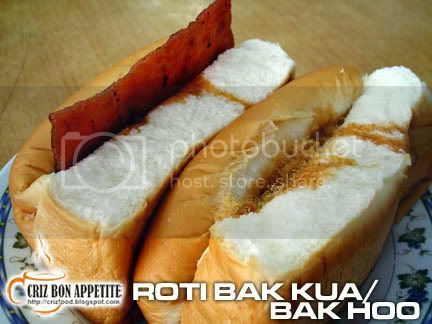 hey the roti bak kua and ba hoo how much? u just put RM without the figure. next time shd ask me go there also mar…. long time never eat popiah. need to control on consuming fried food. Oh wow, I am just dying for some laksa now! And best thing is, it’s the original ikan kembung, not sardines which I notice are being used more and more in laksa. It’s just the same without kampung huu!